Duke Watson in 2006. © Tom Miller. In June 1945, following surgery and convalescence, Duke resumed mountaineering by making an ascent of Mount Vesuvius in Italy. He was on a pass from the hospital in Naples. Returning to the Northwest after his Army discharge, he worked for timber companies for several years before establishing his own lumber wholesaling business in Seattle. He renewed his acquaintance with Fred Beckey, who had received a medical discharge from the Army before Duke went to Italy, and they did several climbing trips together in the Cascades. On Memorial Day, 1947, they made an attempt on the South Peak of Hozomeen Mountain, which was thwarted by bad weather. (Two weeks later, Beckey returned with another party to make the first ascent.) In 1958, they made the first ascent of the North Face of Golden Horn from the Methow River. In 1963, with Tony Hovey and Vic Josendal, they made the first winter ascent of South Twin Sister, near Mount Baker. 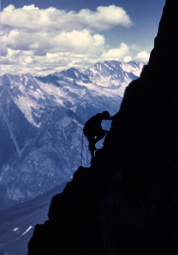 Duke didn’t focus on making first ascents, but he made hundreds of climbs in the North Cascades and Canada, many of them in areas that had been visited only once or twice before. In 1958 he visited the Northern Picket Range with Vic Josendal, Maury Muzzy, Phil Sharpe and Warren Spickard. They climbed Whatcom Peak, Mount Challenger and Crooked Thumb and capped off their trip with the first ascent of the West Peak of Mount Fury. Warren Spickard described the climb with great satisfaction as “the last great first” in the North Cascades. Duke met Warren Spickard in the early 1950s, and they developed a close friendship. Spickard, a physician, became Duke’s doctor. On August 23, 1960, with Dave Scott, they climbed the west summit of Black Peak, an ascent that has gone unreported until now. (Beckey’s Cascade Alpine Guide credits the Firey-Meulemans party in 1966 with the first ascent of Black’s west peak.) That trip also included an ascent, though not the first, of a 7800-foot summit near Washington Pass, later known as Wamihaspi Peak (after Watson, Milnor, Hall and Spickard). In 1955, Spickard and Watson climbed Glacier Peak in the Chilliwack Range together. Spickard was fascinated by the Chilliwacks, the most inaccessible mountains in the Cascades at that time. Climbing Mt. Swanzy, North Ridge, in 1945. Courtesy Duke Watson. The two friends returned to the Chilliwacks with Phil Sharpe in 1961 to attempt the Mox Peaks (Twin Spires), first climbed by Fred and Helmy Beckey in 1940. They started with the easier Northwest Peak on August 20. Normally the belayer, Spickard asked to lead on the Northwest Peak, and their ascent went well. During the descent, Spickard was downclimbing last on the rope, with a belay from Duke, when a hold came loose and he toppled over backward. Both Duke and Phil Sharpe had solid anchors, but after Spickard tumbled out of sight, the rope had only the slightest tug. Duke guessed that the loose rock had cut the rope, possibly sparing his and Phil’s lives. Following Spickard’s death, a group of his physician friends started a campaign to rename Glacier Peak in his memory. Duke recalled that Spickard was “definitely opposed to what he called ‘eponymous names.’” But the campaign succeeded, and since 1964, “Glacier Peak of the North” has been officially named Mount Spickard. True to his 10th Mountain Division roots, Duke has remained a skier as well as a climber throughout his life. In 1953, with his wife Marillyn, he accompanied Spike and Mary Lea Griggs, Don and Gretchen Fraser, and others on a scouting trip to Corral Pass, northeast of Mount Rainier, to survey the site for a potential ski area. A couple years later, on a scouting trip with three friends, he climbed a peak across the valley that they had spotted from Corral Pass. “We were sitting up there on this beautiful spring day,” Duke recalled, “and we looked over and said, ‘What is that?’” They were looking at what is now Crystal Mountain. They got out the maps and quickly concluded that they should be scouting there. After an overnight trip to check it out, they switched their focus to upper Silver Creek. Duke and his friend Warren Spickard applied place names, including Silver King, Silver Queen, The Throne, and Three-way Peak, that remain in use today. In 1955, Duke and about a dozen Seattle and Tacoma businessmen formed Crystal Mountain, Inc. After three more years of intensive surveys, they got Forest Service approval to raise money for a ski area. Crystal Mountain opened in the fall of 1962. Duke recruited Ed Link, a former 10th Mountain Division colleague, to be Crystal’s general manager during most of the 1960s and 1970s. Duke has also skied the Cascade backcountry, making early ski ascents of Mount Dickerman (1947), Big Chiwaukum Mountain (1962), Snowking Peak (1963), Snowgrass Mountain (1965), and Ruby Mountain (1967). He made a climb and partial ski descent of Mount Rainier in 1959. For a lumberman and ski area developer, he was very much a conservationist. 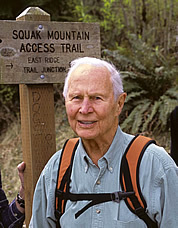 Duke was an early member of the North Cascades Conservation Council in 1957, served on its board, and was later president of the North Cascades Foundation. In the early 1960s, the United States Ski Association declared its opposition to a National Park in the North Cascades, concerned that a park would preclude ski area development in the region. In a 1963 letter to Northwest Skier magazine, Duke cited his involvement with Crystal Mountain as evidence of his support for organized skiing. But he stood behind the park. “Along with lift skiing,” he wrote, “a number of us have also found time for touring in the high Cascades. From this experience I can state with conviction that there are alluring prospects for lift development almost too numerous to count outside the [proposed park] boundaries, including every type of terrain that is found within. The well-meaning officials of the USSA should put on climbing skins and take a look for themselves!” Thanks to the efforts of Duke and many others, the North Cascades National Park was established in 1968. In spite of his long experience as a climber and skier, Duke’s most remarkable outdoor achievement took place far from mountains, and began when he was over 50 years old. In 1967, when he and several friends had sons nearing college age, they planned a father-son canoe trip to the Hudson’s Bay region. Duke had made two canoe trips into the Boundary Waters of Minnesota in the mid-1930s. In those days, the area was wilder than the Far North is today, due to the absence of aircraft. The 1967 canoe trip rekindled Duke’s love of rivers and lakes, reminding him, perhaps, of his Huck Finn youth spent on the Mississippi. Duke took fifteen years and many trips to complete his 7,000-mile trans-Canada canoe project. He and his wife, Marillyn, handled most of the logistics and he invited many friends over the years to accompany him. All sorts of side trips emerged from the core effort. One link-up extended from Duke’s house on Puget Sound to the Arctic Ocean. Ultimately, he canoed almost 20,000 miles throughout Canada. Copies of his three-volume journal, totaling more than 1,200 pages, have been donated to the University of Washington and Seattle Public Libraries. Recently, one of Duke’s nephews has been working on an illustrated volume, scanning photographs and putting them on CD-ROM. Duke planned the final leg of his trans-Canada canoe crossing to be the segment reaching the Pacific Ocean. Fittingly, his wife, Marillyn, accompanied him on this trip. When they finally reached tidewater, Duke, perhaps reluctant to admit that the journey was finished, kept paddling straight out into the Bering Sea. To Marillyn, it seemed he was headed for Japan. Exasperated, she asked, “Duke, will you ever stop?” He lifted his paddle and paused, content for a moment to call a halt. But they both knew he would not keep still for long. In retrospect, they agreed that was a metaphor for Duke Watson’s long life of outdoor adventure. First ascent, Golden Horn, North Face, with Fred Beckey. First ascent, Mount Fury, West Peak, with Phil Sharpe, Warren Spickard and others. First ascent, Black Peak, West Summit, with Dave Scott and Warren Spickard. Mox Peak (Twin Spires), NW Summit. Warren Spickard fell 800ft to his death during descent. 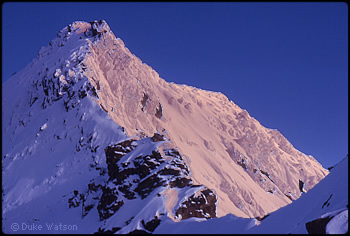 In 1964, the high peak to the northeast was renamed Mount Spickard in his honor. First winter ascent, South Sister (Mount Baker area), with Fred Beckey and others. Mount Monarch expedition, B.C. Coast Range. First ascents of The Queen, First Concubine, Second Concubine. Reconnaissance ski trip to Corral Pass. Subsequent trips led to the survey and development of Crystal Mountain Ski Area, which opened in November 1962. Big Chiwaukum Mountain, ski ascent with Tony Hovey. Snowking Mountain, ski ascent with Tony Hovey, Vic Josendal, Cal Magnusson and others. Snowgrass Mountain, ski ascent with Jack Hossack and Tony Hovey. Ruby Mountain, ski ascent with Tony Hovey. 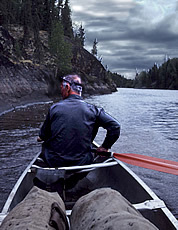 Duke's canoe odyssey began in 1967 with a trip from Reindeer Lake, Saskatchewan to Southern Indian Lake, Manitoba. In 1977 he completed the final segment from Beaver, Alaska to the Bering Sea with wife Marillyn. Duke made a few more trips through 1982 to improve upon segments of his trans-continental route. 2 trips, Atlantic and Arctic watersheds, 456 miles. 8 trips, Atlantic and Arctic watersheds, 1,407 miles. 6 trips, Atlantic, Arctic and Pacific watersheds, 1,249 miles. 3 trips, Atlantic watershed, 1,068 miles. 3 trips, Atlantic and Pacific watersheds, 785 miles. 2 trips, Atlantic and Arctic watersheds, 447 miles. 7,013 miles. Duke's northern travels by canoe, foot, skis and snowshoes through 1998 totaled almost 20,000 miles.